Item 名稱: THAI AMULET NGAN NGUNG KHMER GAMBLING LUCKY MONEY RICH FATHER MOTHER LP CHUEN 1ST BATCH. Por-Ngan Mae-Ngan 1st Batch LP Chuen Wat TaEi, Buriram B.E 2543 2 side (Front as Father / Back as Mother) made from magic enigma metal mixture such as sheet yant metta yai and lek, Sheet yant mahasaneh, Sheet yant Paya hongthong, Old metal Skewer corpse, the tack coffin lid the bottom embed Phong ghost bone died Saturday Cremate Tuesday, Phong Kuman thong Lp Chuen, Magic phong wan 108 type , Phong wan dok thong, all phong will help up the powerful can to fast success . Size: 2x4 cm Every piece comes with a official temple code (ช) on beside. LP Chuen only made Phra ngan and consist of male and female ngan. LP Chuen only made this batch of Phra ngan and no more before he pass away. The first and only batch of Phra Ngan strongly blessed and commissioned by Luang Phor Chuen whom comes from Cambodia which is one of the "birthplace" for the worship of this Deity. 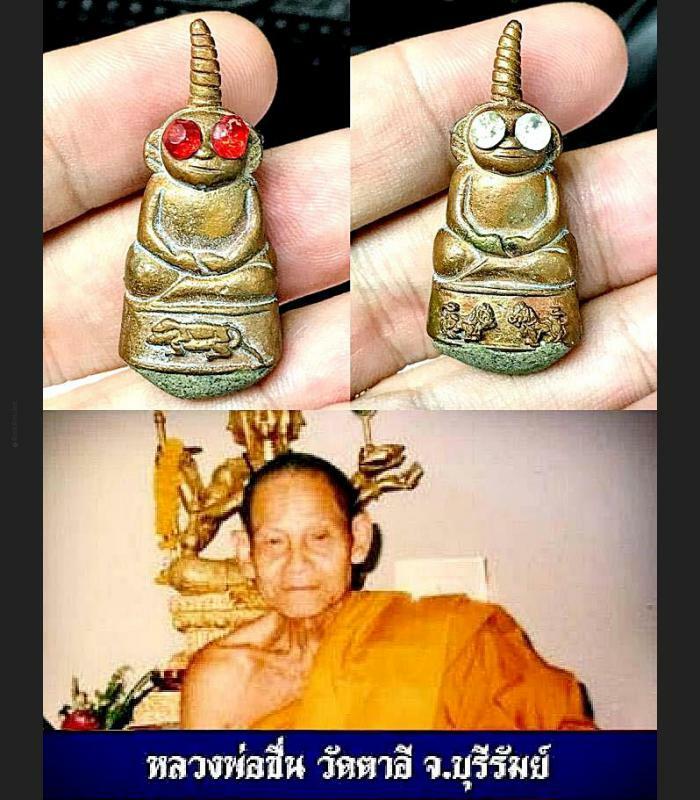 This Ngan have mixed many MUAN-SAN ingredian Holy magic material which has high powerful. 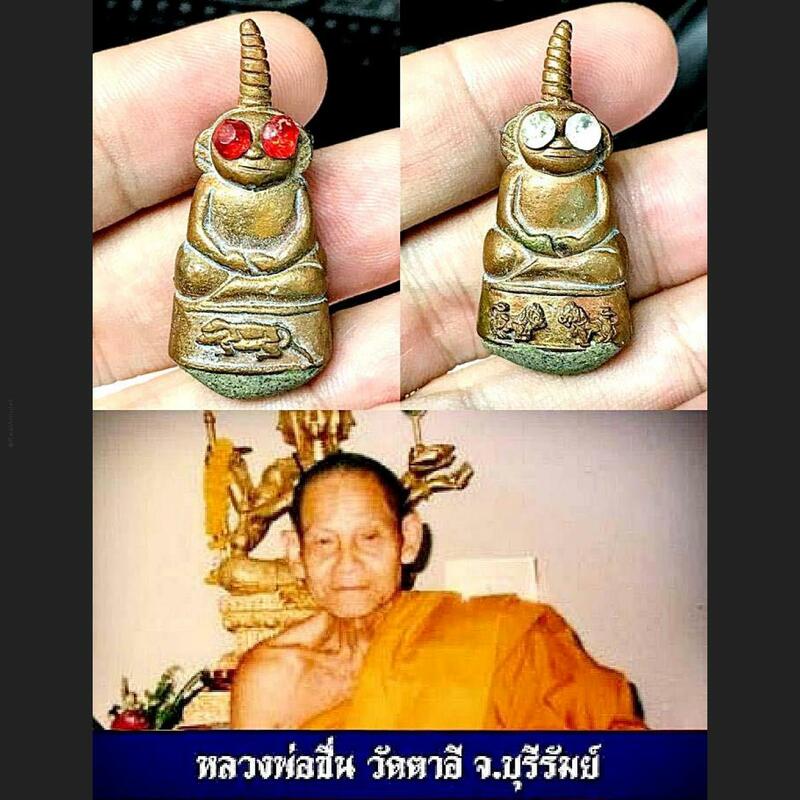 This is not 1 but 2 Deity which consist the powers of the Father Ngan (Phor Ngan) and Mother Ngan (Mae Ngan) the side with the "red eyes" is the Father and the other one with the "white eyes" would be the Mother. The worship of Phra Ngan is often shrouded in mystery and usually associated with the Khmer occult practices. Many variations to the origins of the tutelary Deity of Khmer origins. This Deity is said to govern over the realm of spirits and is said to bestow blessings that can cover many aspects of one's life if it is worship with a correct mindset. Made of various powerful sacred yant sheets personally drawn and blessed by Luang Phor Chuen for powers of "Metta Maha Saney" (Luang Phor's trademark), "Paya Hong Thong", "Metta Yai and Metta Lek" and "Klaew Klad" (Protection Against Harm and Danger) melted together with coffin nails. It features a pair of mating Jingjok (base) on 1 side for Attraction, Charm, Wealth and Luck and the other side features a pair of Thai "Qi Lin" (base) for Authority and Power. Each piece is specially soaked in Luang Phor Chuen's famous Nam Man Prai and the base of the statue is stuffed with his usual "Good Stuff" like Bone Ash, 108 Phong Wan Viset and Phong Wan Dok Mai Thong ("Golden Flower of Sexual Attraction and Charm") All this powerful combination makes this Phra Ngan statue one of the most powerful version ever created by any Guru.